Superior Compartment Door Interlocks are manufactured in a number of different types for the Interlocking of compartment or cell doors, gates, access hatches, manways, access doors, safety fences, etc. This prevents access to enclosures, hazardous machinery, high voltage areas, automatic robotic equipment, high or low temperature areas, chemically hazardous vessels, dangerous gangways, compartments or other restricted areas, etc. until a key, signifying that entry is safe, is inserted in the Interlock. An essential feature of all Superior compartment door Interlocks is the key retaining feature which prevents the removal of the key from the Interlock until the doors are returned to the closed position. The removal of the key locks the door closed. The key, when removed, gives evidence that the compartment door is locked closed. In Superior Compartment Door Interlocks, the key retaining function is accomplished by means of a set of tumblers built into the interlock, which require that a prong shaped device known as a bolt eye, be introduced into the slots of the Interlock unit. Upon removal of the key from the Interlock the bolt eye is securely locked in the Interlock. The Superior Compartment Door Interlock, type B-1496 is designed for surface mounting on the door jam or barrier adjacent to the group of doors to be Interlocked. In the usual installation, the Interlock is mounted on the door and the bolt eye is mounted on the doorframe or jam. For some applications this can be reversed. The B-1496 unit with our Bolt Eye Chain adapts to many industrial applications including those where poor alignment of door and frame exist. This unit is best suited for sliding doors and fence or gate access applications. 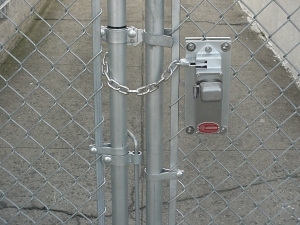 When the Interlock is mounted this way, and the key of the Interlock is removed, the door is positively locked closed. The B-1496 unit is available in single or two key types. The two key unit requires both keys to enter the compartment, or Interlocking of doors in sequence. For sequential operation the initial key is required to enter the compartment and a second key is removable for the accomplishment of the next step in a series of operations.